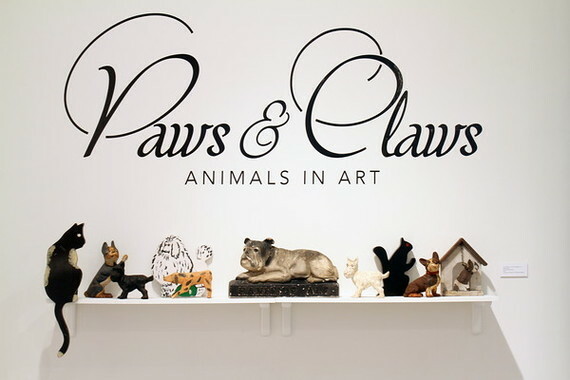 Paws & Claws at the Cultural Council of Palm Beach County is a twenty-first century take on the historically significant subject of pets and other seemingly benign animals in art, a bird's-eye view of contemporary South Florida artists who have embraced this topic in sculptures, paintings, photographs or on paper. While some may snarl or howl at the subject of pets in art, and consider it kitschy, its backstory is most esteemed. Hockney's Stanley and Boodgie, Warhol's Archie and Amos, and Picasso's Lump were all dachshunds who became lyrical and frequent portrait subjects for their masters. Alberto Giacometti's attenuated bronze Cat (1951) was auctioned by Christie's five years ago for $20.8 million, while his littermates can be viewed slinking through the collections of the Metropolitan Museum of Art and the Fondation Maeght in St. Paul de Vence. And their counterparts, Giacometti's emaciated stealthful Saluki Dog quasi-silhouettes, dwell in such doghouses as the Museum of Modern Art, the Wexner Center for the Arts and the Hirshhorn Museum. Picasso's legendary portrait of Dora Maar with Cat (1941) was auctioned by Sotheby's for $95.2 in 2006, making it one of the most expensive artworks in history. Jeff Koons' joyful Puppy (1992) has been planted in Rockefeller Center (2000), and Sydney's Museum of Contemporary Art (1995), and today this flowering 43-foot West Highland terrier permanently stands guard at the Guggenheim Museum in Bilbao and on the lawn of the Brant Foundation in Greenwich, Connecticut. For centuries, artists have been fascinated by pets. Jan van Eyck's 1434 Arnolfini Portrait (also known as The Arnolfini Wedding, now hanging in the National Gallery in London), one of the most revolutionary portraits in the annals of western art, depicts a wealthy couple, the woman wearing an ermine trimmed green silk cloak, her affenpinscher dog alert at her hem. Pairs of sacred Chinese Foo dogs first appeared as protective statues nearly two thousand years ago (although some say they were never meant to be dogs, but lions.) Both the Empress Josephine Bonaparte and Emma, Lady Hamilton, the mistress of Napoleon's nemesis Lord Nelson, were famously depicted with their lapdogs. Emma, who served as muse to the artist George Romney, and her dog, can be found in the Frick Collection, while Josephine, with a dog and a fortune teller (though not her famous pug, Fortune), painted posthumously by Sir David Wilkie, belongs to the National Gallery of Scotland. Valazquez' masterpiece, Las Meninas (1656), at the Prado Museum, features a mastiff dog foreground of the Spanish royals. Katherine of Aragon was portrayed with a pet monkey around 1525 by Lucas Horenbout. Fabritius' small chained luminous Goldfinch, painted in oil in 1654, was the subject of the 2014 Pulitzer Prize winning work of fiction. Joseph Wright of Derby painted two girls dressing a kitten (1768-1770), while Henry Raeburn pictured a boy with a pet rabbit (1814). Courbet and Manet famously depicted women with parrots in 1866. Pet dogs and cats have been painted by such legendary and diverse artists as Cranach, Bronzino, Fragonard, Charles Wilson Peale, Monet, Munch, Tissot, Toulouse-Lautrec, Gauguin, Bonnard, Valadon, Cassett, Avery, Wyeth, Barnet, Neel, Balthus, Bacon, Banksy, Simmons, Freud, Murakami, Otterness, Rosenquist, and Katz (who did collage a cat but seems to prefer sheepdogs as subject matter). Hunt Slonem has built a reputation painting exotic birds from his own extensive aviary, although rabbits seem to be his preferred models lately. And contemporary photographer William Wegman's anthropomorphic portraits of his pliable, often costumed Weimeraners Man Ray, Fay Ray, Flo and Wendell, are to be found in the permanent collections of the Whitney, the Hammer, the Centre Pompidou and the Smithsonian. Clearly a serious art show portraying pets and other benevolent animals should attract all but the most zoophobic. 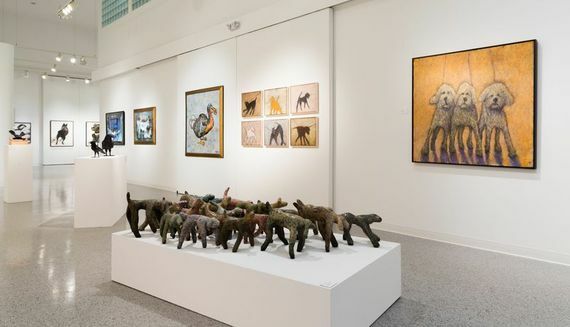 Palm Beach's Cultural Council Curator Nichole Hickey decided that contemporary cutting edge depictions of animals would make for an accessible show for all age groups, with sociological and ecological impact. A Palm Beacher for ten years, she says that she "became familiar with the work of many talented artists and knew I could easily find a roster that would pertain to the theme." 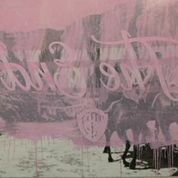 Eleven artists are represented in the show. Located in the historic Robert M. Montgomery, Jr. building in downtown Lake Worth, the Cultural Council is the official support agency for art and culture for Palm Beach County, serving non-profit organizations, individual artists, and arts districts. 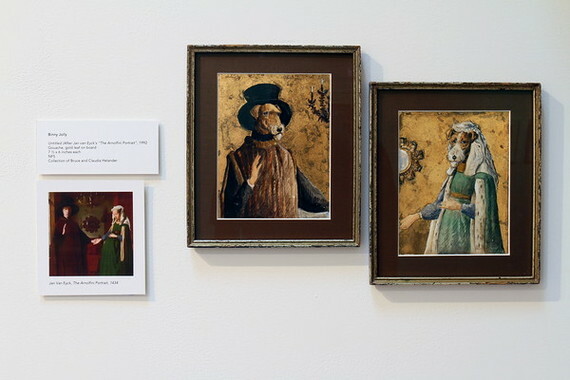 Binny Jolly's clever gouache portraits have been appropriated from the famous Van Eyck Arnolfini Wedding, only here the silk and fur clad moneybags couple are a pair of dogfaced terriers. 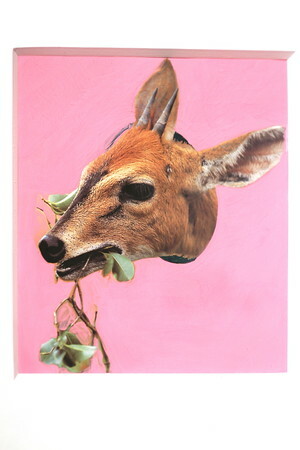 Pink, by Sibel Kocabasi, is a mesmerized and mesmerizing deer caught in the artist's headlights. Kocabasi trained in traditional Turkish arts and has been working on a series that "focuses on the relationship between humans and other animals showing both humor and frustration." 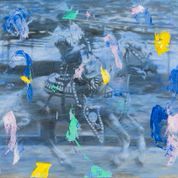 Miroslav Antich's Untitled is an ode to the iconic American cowboy and his horse. Like art star Richard Prince and Marlborough Man photographer Jim Krantz , the Belgrade born Antich has been drawn to this filmic Americana imagery. 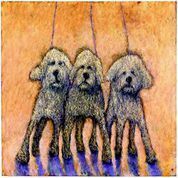 Skip Hartzell's three Dogs of the Apocalypse look like they are ready to leap from their leashes. Hartzell specializes in dog paintings and dog sculptures but emphasizes that his subjects are really "form, movement, color, texture." 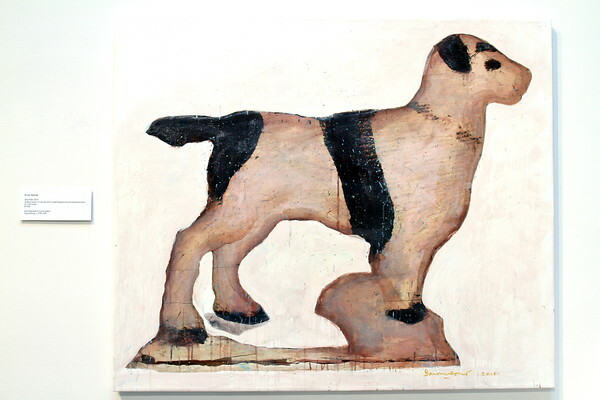 Bruce Helander (who is also a Huffington Post contributor), while best known for his witty collages employing vintage images and materials, here presents Dog Daze, a both fanciful and highly realistic painting of a found object, a vintage dog shaped ashtray. Helander, whose work is in numerous museum collections, was recently inducted into the Florida Artists Hall of fame. 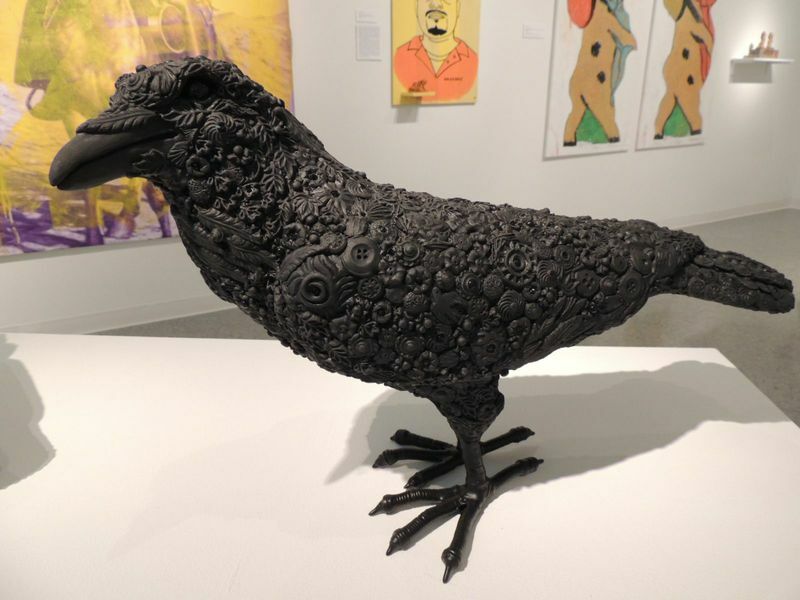 Karla Walter works in ceramic, creating unique and whimsical crow sculptures with vivid personalities. She notes, "Crows are messengers, omens for change. Several personal encounters with crows have compelled me to express my personal creativity through this messenger. This body of work explores the similarities between the social interactions among crows and that of humans. To know the crow is to know ourselves." Anthony Burks Sr.'s handsome portrayal of a Humpback Whale, is a mixed media piece, employing color pencils, pastels, and watercolors. 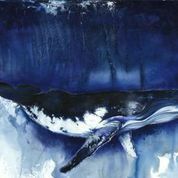 Native Floridian Burks is an artist specializing in marine life and endangered species. 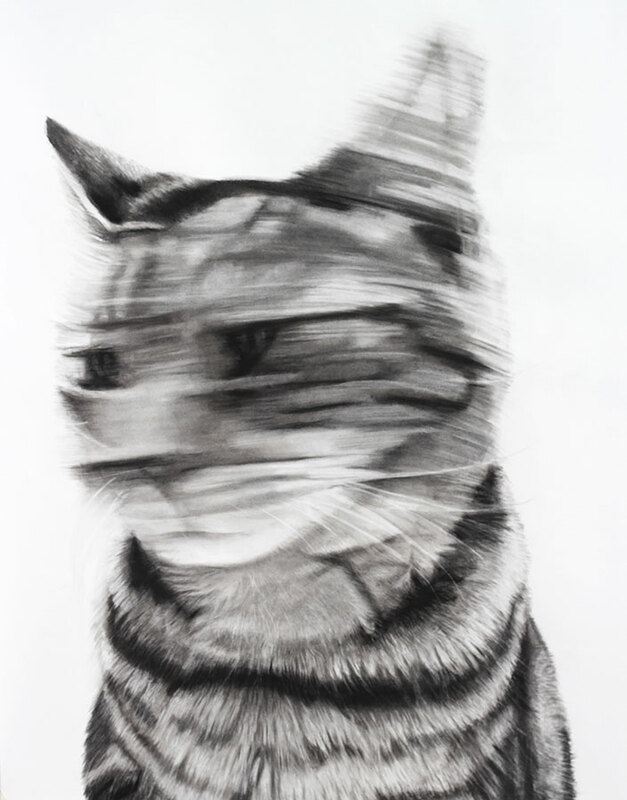 Virginia Fifield masterfully employs charcoal on paper as her medium, drawing large scale almost photorealistic images taken from nature. This cat didn't seem to want to stay still for its portrait!